By “my” stadium Cetnar actually means “their” stadium: Bears and Eagles Riverfront Stadium was built and is owned by the city of Newark and Essex County. Cetnar, a former Newark police officer booted off the force after being convicted of embezzling drug buy money, has been a tenant there since buying into the bankrupt Bears franchise last fall. This entry was posted in Newark Bears by Neil deMause. Bookmark the permalink. Turns out I was wrong about the fiscal bankruptcy. Turns out I was right about the moral bankruptcy. Weird how the more super an American patriot, the more insecure and distrustful they are that America can withstand, and benefit from, dissent. Won’t be going to Bears games unless ownership shifts to someone who, y’know, loves this country. “MY STADIUM”????? a typical response from those in the sports biz who confuse the use of a taxpayer funded facility as their personal property. 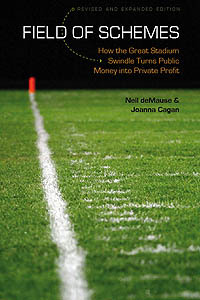 fans, ownership and politicians have to be brought back to reality that their feeding at the public trough has to stop. demand accountability from those involved! AP and the Star-Ledger have picked up this story. As is typical of the Liberal Media they omit the juicy stuff about the ex-cop/Giuliani wannabe.